Toys are easily one of the hardest things to keep tidy and organised in our home, with a toddler who has no intention of picking up the mess she makes. But then again, few kids do. 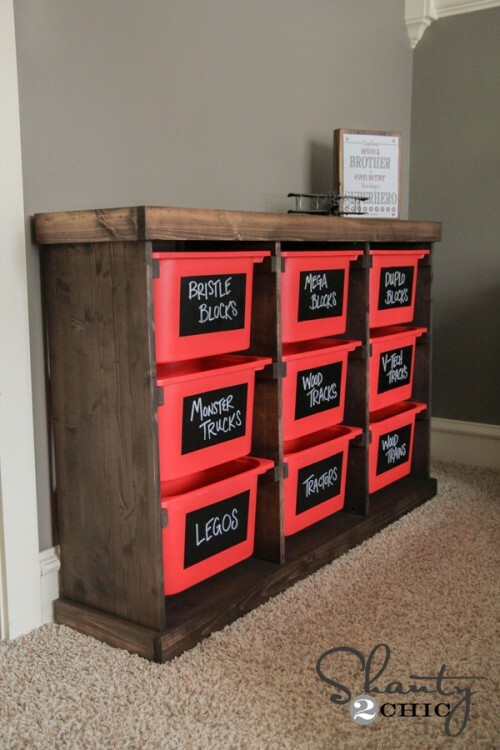 A while back I put together a list of awesome toy storage ideas found on Pinterest to inspire and motivate you to declutter your life, and kids rooms. It has been one of my most popular posts via search engine traffic. So it might be time to have a follow up of awesome toy storage ideas. Hopefully there is an idea here perfect for your kids rooms… or elsewhere in your house perhaps. Do you have favourite awesome toy storage ideas? The library wall is cool. Great ways to encourage a love of reading too which is an important bonus. What great ideas! 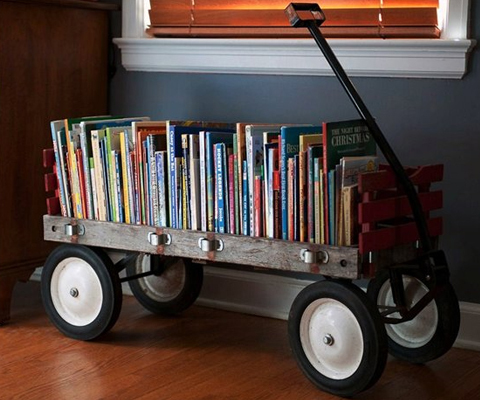 The book wagon is so cute and that library wall is just dreamy! At any age, having cool, functional storage is a bonus. Even I would be happy with a library wall. I too find it hard to keep the toys contained in our house. Storage is paramount. I love all of these ones that you’ve source. The book one is interesting because it shows all the titles that you own… but not so easy for the little kids to reach. I reckon that should hold the really special books that the kids can’t pull apart! Gorgeous ideas! We recently finished the renovation of our first house and I’m currently trying to handle with the storage space. My kids have their own rooms now and it’s very important for me to store their toys and clothes , etc. properly, but at the same time not to reduce their place for playing. Your post gave me some great ideas that seem to fit perfectly for our house. Thank you for the inspiration!